Chennai Super Kings (CSK) vs Mumbai Indians (MI) is regarded as one of the biggest rivalries in cricket. Some might even call it the El Classico of Indian Premier League (IPL). It has also been known as the Super-Indian derby. It all started when they first met each other on April 24, 2008. The Super Kings won that first match by a narrow margin of six runs with the help of Matthew Hayden's blistering knock of 81 runs off 46 deliveries. Since the inception of the league, Chennai and Mumbai have faced each other 26 times (Champions League Twenty20 matches included). The Mumbai Indians have the upper hand, winning 14 times, while the rest 12 matches have gone in the favour of the Super Kings . Both teams have won the league thrice with the Mumbai Indians winning it in 2013, 2015 and 2017. Though the trend suggests 2019 will be Mumbai's year to have their hands on the coveted IPL trophy, it will be interesting to see whether it happens or not. On the other side, the Chennai Super Kings have also won the league thrice in 2010, 2011 and lately in 2018. Suresh Raina is the leading run-getter in the derby with 673 runs in 26 matches for Chennai. He is followed by the Mumbai skipper Rohit Sharma with 548 runs in 21 games. Lasith Malinga and Dwayne Bravo are the leading wicket-takers for their respective sides in the derby as well as in the league history. Dwayne Bravo, Dwayne Smith, Michael Hussey, Thisara Perera, Tim Southee, Parthiv Patel, Ashish Nehra, Ben Hilfenhaus, Jacob Oram, Karn Sharma, Harbhajan Singh and Ambati Rayadu are some of the biggest players to have played for both teams in the IPL. Mumbai Indians and Chennai Super Kings' clash for the 2019 season is scheduled on April 3. The match will be played at Wankhede Stadium, Mumbai with its reverse fixture yet to be announced by the Board of Control for Cricket in India. 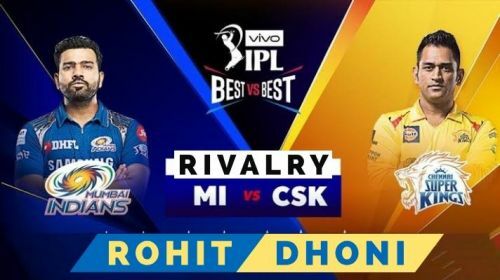 The CSK-MI rivalry is one of the most exciting matches to look forward to at the IPL and it will be very interesting to see which team will have the last laugh this season.